Police action was spread across the continent, with at least nine separate raids, including in the Netherlands where servers were uncovered. However, it was determined that these were in place to hide the true location of the operation’s main servers. Similar ‘front’ servers were also deployed in other regions. The main servers behind the IPTV operation were located in Petrich, a small town in Blagoevgrad Province, southwestern Bulgaria. No details have been provided by the authorities but TF is informed that the website of a local ISP, Megabyte-Internet, from where pirate IPTV has been broadcast for at least the past several months, disappeared on Tuesday. It remains offline this morning. The company did not respond to our request for comment and there’s no suggestion that it’s directly involved in any illegal activity. However, its Autonomous System (AS) number reveals linked IPTV services, none of which appear to be operational today. 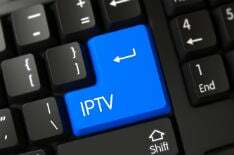 The ISP is also listed on sites where ‘pirate’ IPTV channel playlists are compiled by users.